Archaeological Museum Sanchi established on the hilltop, in 1919, by Sir John Marshall. 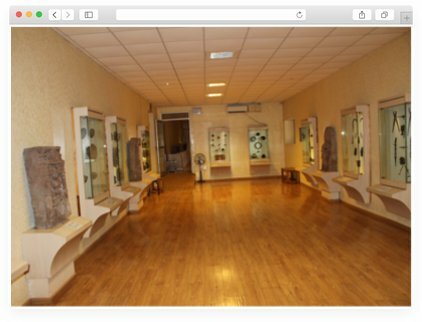 Subsequently, Archaeological Survey of India acquired a college building at the foot hill of Sanchi Stupa and got the exhibits shifted to the new building in the year 1966 and in the same year the museum was opened for the public. The museum comprises main hall and four galleries besides exhibits in the verandah and a few in open courtyards. In the main hall the exhibits represent to six cultural periods i.e. Mauryan, Sunga, Satvahana, Kushana, Gupta and late Gupta periods (circa 300 BCE - -700 CE). Among the objects of Mauryan period, the magnificent Lion Capital of Ashoka with remarkable mirror like luster is most noteworthy. Lion Capital, one of the master pieces of Mauryan art datable to 3rd century BCE is displayed in the rear side of the main hall of the museum. 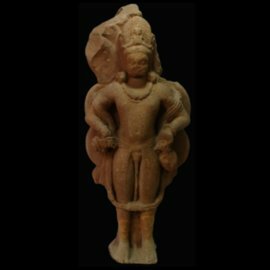 In the main hall a colossal figure of Padmapani stands in samabhanga posture carrying a lotus in his right hand while left hand rests upon the thigh holding the knot of Uttariya (dhoti). A beautiful Yakshi figure in tri-bhanga posture with bare body belongs to Satavahana period is displayed in the main hall. Assignable to post Gupta period a colossal figure of Nagaraja in human form is displayed in the main hall. He is canopied by a snake hood in which only five snakes are survived. Buddha in dhyana mudra on padamasana displayed in the main hall having curly hair. His face is rounded and a kind of smile is observed on it. 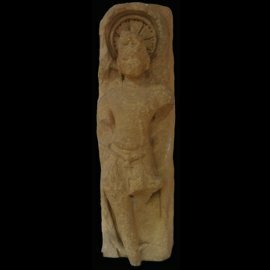 Gallery one displays large size Buddhist Sculptures made of sand stone. These sculptures bear Gupta as well as late medieval period art traditions. 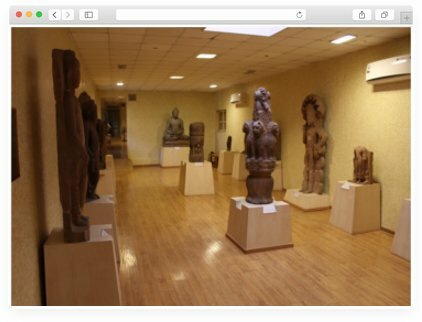 A clumsy copy of replica of Asokan pillar capital of Gupta period with Dharma Chakra supported by four lions seated back to back displayed here is the main attraction of the gallery. 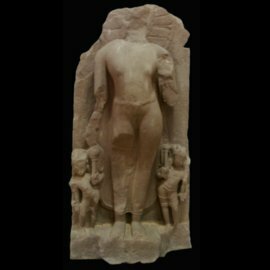 Other notable sculptures are Buddha in meditation bearing auspicious symbols on toes, palm etc, sthanaka (standing) Buddha in varad mudra and two large images of Nagraja. Gallery 2 is divided into two parts. First part(on left side) comprises of miniature sculptures datable from 3rd century BC to 12th century AD, while on the right side iron objects belonging to medieval period are displayed. The displayed miniature figures, terracotta & stone plaques, both Buddhist and Brahamical, denote cult affiation from Sunga to early medieval period. A colossal figure of lord Buddha assignable to the post Gupta period is displayed in gallery no.1. 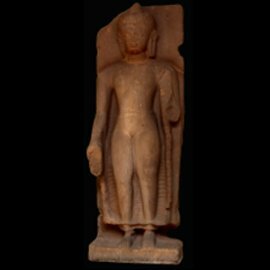 A colossal figure of Buddha in dhyana mudra on padma pitha represents Gupta period is displayed in the gallery no.1. A votive stupa displayed in the gallery no 1 portrays three Dhyani Buddhas at the cardinal sides on octagonal base but the fourth Buddha is missing. Stone plaques depicting Mahisasurmardini, Vishnu, Ganasha and Lajja- Gauri are displayed in a wall showcase of gallery no 2. Displayed in the gallery no 2 a miniature figure is datable to 10-11th century AD. Both of his back hands are missing. A unique figure of dancing lady along with a singer and a drummer datable to 10th-11th century AD is displayed in the gallery no 3. Sir john marshall was the Director-General of the Archaeological Survey of India from 1902 to 1928. 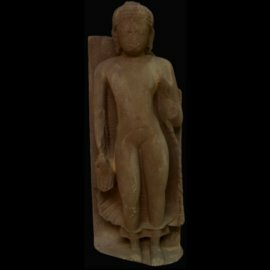 He was responsible for the excavation that led to the discovery of Harappa and Mohenjodaro, two of the main cities that comprise the Indus Valley Civilization.